Not just A Lawn on D, THE Lawn on D | JCALPRO, Inc. Doing literally anything at the DMV. An uber ride with a driver who won’t stop explaining to you why he deserves the entertainment center in the divorce, as if you have anything to do with it. If you chose anything other than winter in Boston – well, congratulations: you did not spend winter in Boston. For me, the official opening of the Lawn on D was winter’s waving of its white flag. No more salt-stained shoes. No more “Really? In this weather?” inquisitions from my uncultured friends when I order an iced coffee from Dunkin’. No more crying when I have to wait more than 2 minutes for the T (which you probably know, is ALWAYS). The spring has sprung! With JCALPRO’s help, the Lawn on D has an impressive line-up for the upcoming months. When you stop by – which I know you will! – look for JCAL’s work: if you can see anything out there on the Lawn after dark, you’re welcome! JCAL is responsible for rigging the Lawn’s lighting, along with assisting with any colored lighting for special events. JCAL also helps out the Lawn by prepping it for that not-so-casual winter I mentioned above: we take down the lights and winterize the tent after the Halloween events. And whenever events with mobile stages or truss work roll through, we’re there to make it happen! Yardwork has never looked better. Here are some opportunities you’ll have this month to come see JCAL’s work and experience what that Lawn on D Street is really all about! Don’t miss ‘em! An alien. A suburban California neighborhood. 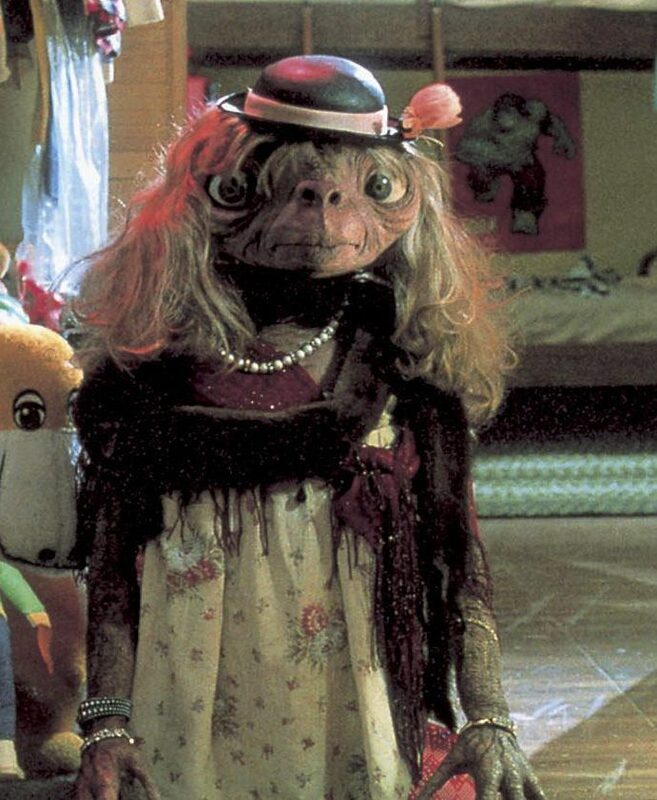 Some subtle Reese’s Pieces product placement (used by Elliot to lure an abandoned E.T. to his house). A young and adorable Drew Barrymore. Super powers. A bicycle. That just about sums it up. Still not convinced to come? Let’s see if this changes your mind. Come on, how could you say no to that face? Picture this: We Bought a Zoo, but replace the animals with dinosaurs, and instead of anything going right everything goes wrong. It’s the recipe for a perfect movie. With Jurassic World: Fallen Kingdom, the sequel to Jurassic World, coming out in less than a month (June 22nd to be exact) it’s wise to brush up on your Jurassic knowledge. And if you’ve never seen the movie… I’m at a loss of words. Be there: June 7th, 8 P.M. I’ll be taking attendance. (In all seriousness though, it’s my go to “What’s your favorite movie?” answer and I highly recommend it to anyone and everyone. PLUS, I can’t even think of a better way to experience it than on a big screen in a dark field). This will be you in disbelief of the special effects Steven Spielberg was able to pull off back in 1993. Follow the Lawn on D on social media for updates on more movies to come! Bring your ~best vibes~ ~best moves~ and ~best friends~ to the summer concerts on the Lawn and discover a handful of new artists! Comanchero: 6 – 10 p.m.
Wolfpack Band: 6 – 10 p.m. Unity: 3 – 6 p.m.
Brian Delac: 7 – 10 p.m. Pop Disaster: 3 – 6 p.m.
DJ Dakeya: 7 – 10 p.m.
Hit Play: 7 – 10 p.m.
Radiostar: 3 – 6 p.m.
Back to the 80’s: 3 – 6 p.m. Follow the Lawn on D on social media for updates on more live music to come! Do you have the perfect Spice Girls’ ensemble in your closet and finally have enough friends to pull it off? Do you, for whatever reason, dream of a socially acceptable opportunity to dress up as Goofy and Roxanne of A Goofy Movie with your significant other? Is your most overdone party trick doing the Carlton? Are you ready for (a.k.a desperately in need of) a fresh audience? Dust of your argyle sweaters, people. Slip into those over-sized overalls. 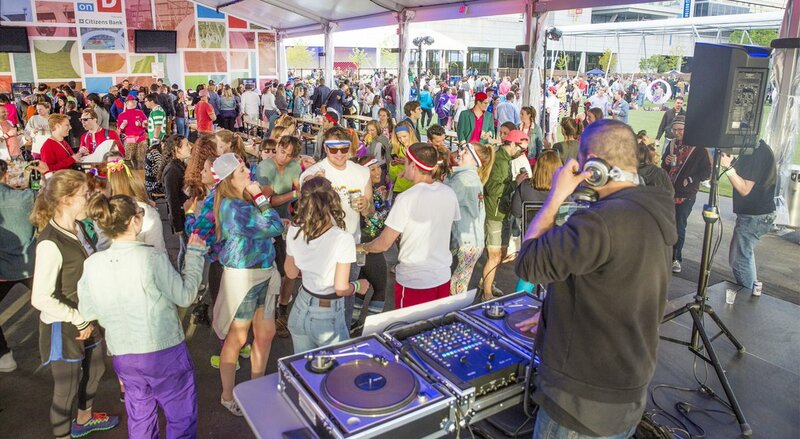 The Lawn on D will be hosting a 90’s themed party on May 24th in celebration of the Harpoon IPA 25th year anniversary. And don’t hold back: there will be prizes for the most authentic ’90s outfits. Free tickets to Harpoonfest anyone? On June 16th, The Red Sox, Celtics, Bruins and Patriots will be bringing a collection of championship trophies down to the lawn. I can’t say that Tom Brady or Larry Bird will be hand delivering the trophies – if I could I wouldn’t need to write a whole paragraph explaining why you should come – but a chance to revel in the glory of Boston Sports on a casual Saturday afternoon is pretty cool too. Bring the kids, tell them about the flat screen TV you were about to rip out of the wall during Superbowl LI until Julian Edelman made a catch so unbelievable you started considering that the Matrix might actually exist. Relive the breaking of the curse. Out of state friends? Time to remind them of all the times their teams lost to ours! Remind everyone why they love to hate our Boston teams. Come on, don’t leave the Lawn hangin’! Follow the Lawn on D on social media for updates on more special events to come! Even when there aren’t special attractions at the Lawn, like movies or live performances, it’s still a great place to spend time. **Unless private events are booked. Check THE CALENDAR for details. Outside food and beverages are permitted whenever concessions are not being served! This makes the Lawn on D a perfect weekday picnic spot. The Boston Commons are lovely of course, but if “less overly-confident squirrels” is on your green space checklist, the Lawn is the place for you. And the best part about the Lawn, as far as my college-kid bank account is concerned? It’s free!